The tradition of military tattoos can be traced back to the Civil War, with soldiers on both the Union and Confederate sides often getting tattoos to mark their loyalty to the cause. Since the 1800's, each war has inspired its own tattoos, ranging from slogans against enemies to large American flags. Today, each branch of the military has its own rules and regulations about what sort of military tattoos, as well as content and placement for other tattoos worn by service members. 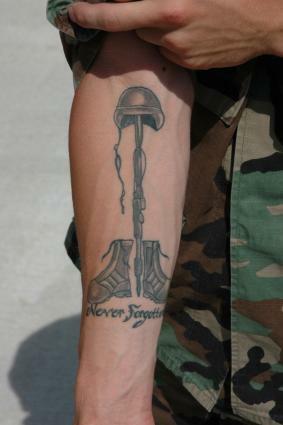 Military tattoos have become an important part of the tradition of military service. If you are currently in the service and are considering a tattoo, make sure to know and follow your military branch's regulations. The United States Army has recently revised its policy on tattoos and other body modifications. Previously, any tattoo on the hands or neck would be disallowed, but now these tattoos have been permitted. No facial tattoos are permitted, but visible tattoos on other parts of the body are now allowed as long as they are tasteful and are not "extremist, indecent, sexist or racist". Camouflage: Camouflage makes a great half or full sleeve tattoo, but due to regulations, you'll have to wait until you're out before you can have this extensive of a tattoo. Red beret: The red beret is worn by members of the Airborne Division. You'll often see this beret sported by a skull. This is basically symbolic of the fact that the Airborne Division is always ready for rapid deployment, and since that usually means being dropped into areas of active fighting, death is a constant companion. Green berets: The green beret belongs to special forces units. It's often paired with skulls or wings. Tanks: Often used in the work of Army members, tanks are built to protect and roll over any surface. A tattoo of a tank shows your inclination to do the same. Field cross: A field cross tattoo is used to honor a fallen solider. It depicts a helmet and boots with a rifle. The US Navy allows tattoos of many types, but there are certain limits. 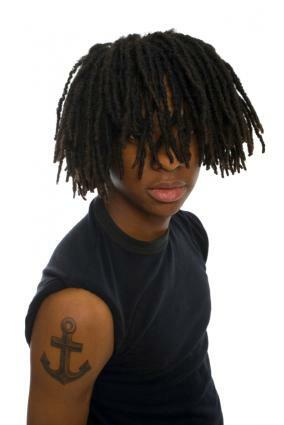 No tattoos may be visible on the head or face. There may be no tattoos that are sexist, racist or offensive. Navy emblem: This design consists of an eagle clutching an anchor and a flag, surrounded by gold chain links. The next ring proclaims "United States Navy" on a blue background, and a rope makes up the outermost layer. Technically you need to have the Navy's permission to use this emblem exactly as is, so service members typically opt to personalize the design. Anchors: This tattoo design has been popular for ages with the Navy as well as other sailors and individuals who feel a kinship with the sea. Nautical Star: The nautical star, or compass rose, helps guide sailors home, and has long been a popular tattoo for naval enthusiasts. The Air Force tattoo policy prohibits tattoos that are obscene or offensive or that are visible when a service member is in uniform. Additionally, the Air Force restricts tattoos that cover more than 25 percent of the body. Wings: Wings are the kind of tattoos most often associated with this branch of the service. Pilots frequently combine their wings with the Air Force logo. 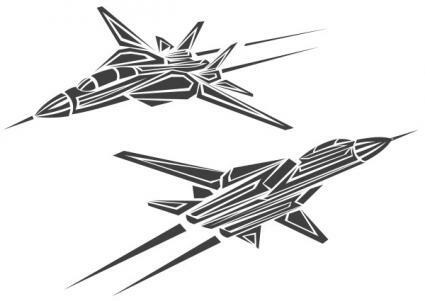 Jets: Fighter jets are another popular theme with the Air Force, often depicted with flames incorporated into the design. Air Force logo: This is a star on a ribbon background. The design is often enhanced with eagles, flags and other patriotic symbols. 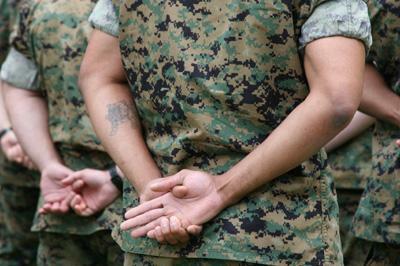 The Marine tattoo policy does not allow tattoos on the head, hands, neck or any other part of the body that is visible when the Marine is in uniform, and sleeve tattoos are considered excessive. Current Marines who have tattoos that violate these restrictions may be allowed to keep their tattoos; however, these tattoos may prevent the Marines from advancing professionally and prevent them from being able to re-enlist. Bulldogs: Bulldogs are the unofficial mascots of the Marines. Crash, Fire and Rescue: Members of this unit of the Marines are extremely proud of their service, so this emblem is a very popular tattoo design. The look varies, but the emblem resembles a Maltese cross and has the words individually inked on the west, north and east compass points of the shield. An eagle and a globe are usually part of the design. 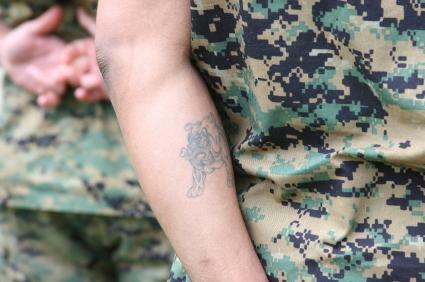 USMC: Many Marines choose the classic Old English lettering of "USMC" as the basis for a tattoo. This basic design is often enhanced by a flag or banner. The Coast Guard updated its tattoo policy in late 2009 to allow for tattoos covering more than 25 percent of the body, but the service member's shirt collar must hide any neck tattoos. This policy allows one ring tattoo on each hand and permanent eyeliner tattoos for female service members. You can view the official Coast Guard tattoo policy by downloading this PDF file. USCG Emblem: The official emblem is by the most popular tattoo design worn by Coasties. The center of the design is a badge-shaped flag, surrounded by a disc that says "United States Coast Guard". This design is layered over a pair of crossed. anchors. Gun boats: Gun boats are frequently associated with the Coast Guard, makes this a natural tattoo design choice for members. Cutters: Cutters are small sailing-style ships used by the coast guard, making them the ideal focus of a tattoo. Helicopters: A helicopter with the coast guard emblem on it can be a powerful tattoo of rescue. 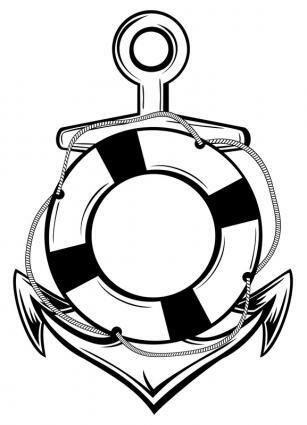 Life preservers: A life preserver can also be seen as a rescue style tattoo popular among Coasties. While some tattoos are associated with one branch of the military, these designs can be worn with pride by anyone with a military background. Dog tags: This tattoo design is suitable for other branches of service, although the Army tends to be most closely associated with it. Some soldiers, especially those who are being deployed to hot spots, choose to have the information from their dog tags permanently inked. This way, there is an easy way to quickly identify themselves should their tags become lost. Malta cross: This symbol is associated with the Sovereign Order of Malta, and is typically worn by medics and other military hospital personnel in all branches of service. While you may want to show your pride in your military service with a military tattoo, consider carefully before you get one if you are still in uniform. Regulations may change at any time, and existing tattoos may not be grandfathered in. Once you have left active service, however, let your colors show proudly with any military style tattoo.